Whether she likes it or not, it’s safe to say that her role as Eleven will probably be one of the most memorable. It’s a good thing too, because she’s committed a lot to it, including chopping off all of her hair. While a woman’s hair is her crowning glory, Millie isn’t afraid to go an extra mile to play the role 100%. Millie is willing to give up a lot of things for her craft, including her first kiss. In an interview with Interview Magazine, the young actress shared that having her first kiss ever done on-screen was part of the job at the end of the day. Seems like sharing a kiss with co-actor Finn Wolfhard was no biggie. A lot of fans, and even haters, previously voiced their concern over the fact that Millie is too often “dressed like an adult” when making an appearance at red carpets. But during the 2018 SAG Awards, she managed to make a statement and prove them wrong by simply strutting on the red carpet in white Converse sneakers. She definitely put the word ‘statement’ in fashion statement with her outfit. To many, it would be a dream come true to work for or with the signature brand Louis Vuitton. And for Millie and her “Stranger Things” co-actors, that dream became a reality. Last year, Louis Vuitton Creative Director Nicolas Ghesquière invited the kids over for a secret project. What an opportunity! If you think acting is Millie’s only talent, think again. The actress also has a talent in singing! In an interview with Extra, the actress revealed that she and rapper Drake are actually friends. Apparently, the rapper met Millie in Australia, and he eventually invited her to his concert. From then on Drake has been teaching Millie the ropes on how to handle fame. 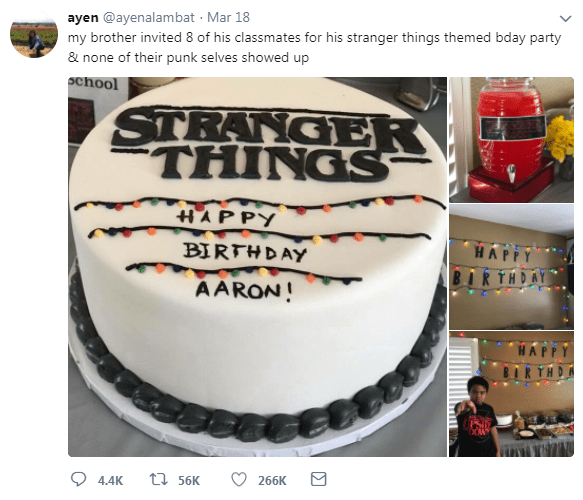 Late 2017, a young boy named Aaron Alambat went viral online for throwing a “Stranger Things” themed birthday party that apparently none of his friends attended. However, when his older sister posted about it, the tweet quickly went viral and the cast was able to take notice. Millie responded with a friendly tweet saying, “What!!!! Oh Well You can let them all know that everyone on behalf on Stranger things would’ve come! I think your [sic] awesome and next year I would like an invite… Please? 😘😘😘”. What a lucky guy! Millie doesn’t just own the stage during interviews or when she sings; the actress knows a thing or two about rapping–specifically Nicki Minaj’s hit, “Monster.” She was able to give the crowd a glimpse of her rapping skills, and she clearly knows word per word. Millie Bobby Brown actually lives in London, thus her English accent. But she did manage to live in Orlando at one point of her life which is why she seamlessly pulled off an American accent in her role as Eleven. Millie may be only 14, but that never got in the way of her bagging awards. She’s managed to take home a SAG Award and an MTV Movie & TV Award. She’s also been nominated for more than 10 awards, including an Emmy!